Discuss state&dash;of&dash;the art cardiovascular and global preventative medicine principles. Carotid IMT/Ultrasound and Abdominal Ultrasound for Detecting Subclinical Carotid Artery Disease and Abdominal Aortic Aneurysms &dash; Does it make a difference? Advance Lipid Testing &dash; Does it Help or Hinder Cardiovascular Disease Prevention? Summarize the value of alternative lipid measurements in enhansing CHD risk prediction vs the traditional cholesteral profile. Dr. Eric Tangalos is a Professor of Medicine at the Mayo Clinic in Rochester, Minnesota. He was Chair of Primary Care Internal Medicine from 1997 to 2006. 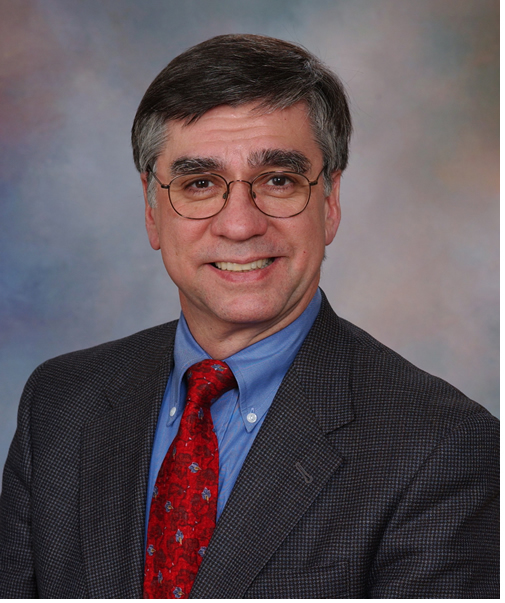 Dr. Tangalos received his undergraduate training from the University of Michigan, is a graduate of the Loyola University Stritch School of Medicine in Chicago, and was a resident and fellow in Internal Medicine at Mayo. He is a past president of AMDA&dash;The Society for Post-Acute and Long-Term Care Medicine and is a fellow and past governor of the American College of Physicians. He is a past director of the American Geriatrics Society and serves on their Foundation for Health in Aging. He served eight years on the national board of the Alzheimer&apos;s Association and was a member of their executive committee. 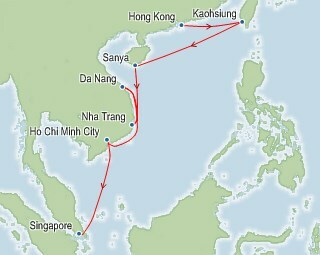 Q: Are there any special visa requirements for cruises to Cambodia and Vietnam? A: For Cambodia and Vietnam, ship personnel will assist each guest required to secure a visa for Cambodia and Vietnam and charge the guests onboard SeaPass® account a one-time nominal fee. These visa fees include a small processing charge by our local representative. All nationalities require visas for Vietnam with the following exceptions: Singapore, Thailand, Malaysia, Indonesia, Philippines, Japan, Denmark, Sweden, Finland and Norway. All nationalities require visas for Cambodia with the following exceptions: Singapore, Malaysia, Philippines and Laos. Please Note: The following nationalities will find it extremely difficult to secure a visa for Vietnam and Cambodia, whether through us or by themselves; Pakistan, North Korea, Afghanistan, Iraq and Nigeria. Please Note: As we will be arranging all visas on board the ship on arrival, immigration will not issue visas for those nationalities that do not require one. These nationalities will be exempt from the nominal visa charge. Da Nang, Vietnam - Located on the South China Sea, Da Nang is a major port city and your gateway to the natural and ancient wonders of Vietnam. Gaze upon the five peaks of the Marble Mountains - long a source of inspiration for Vietnamese artisans; visit the palace and pavilions of Hue, the Imperial City of the Nguyen emperors; and explore the charming merchant town of Hoi An and nearby China Beach. Ho Chi Minh City, Vietnam - Ho Chi Minh is Vietnam's largest and most famous city and is surrounded by rivers and canals. During the 14th century this city was known as Prey Nokor and was nothing more than a trading post. Slowly it grew into a small town, similar to the nearby traditional Cambodian villages. By the 18th century, the Lords of Hue, under the Nguyens, had established control of the trade in Prey Nokor and renamed the city Saigon. From 1833 until 1836, the tight control of the Nguyen leadership provoked a strong uprising, leading to great destruction and massacre until the intervention of the French in 1859. During the Vietnam War, Saigon's population nearly tripled and the city grew uncontrollably. In 1975, at the end of the war, North Vietnam had defeated South Vietnam after 30 years of battle. The new communist regime changed the official name of the city of Saigon to Ho Chi Minh and began to rebuild its economic and social structure. Hong Kong, China - From Victoria Peak, the Hong Kong metropolis is all primary colors and neon, commerce and capitalism. Yet just beyond the highrises are the Fragrant Harbour, Stanley Market, and mainland old China, complete with rice paddies and coolie hats. Kaohsiung, Taiwan - Colonization by the Dutch in the 17th century has left an ample architectural legacy, as did Taiwan's rule by Japan from 1895-1945. Grab a coffee at the former British Consulate, a landmark overlooking the bay. Art lovers can enjoy the outdoors and contemporary sculptures at the Kaohsiung Museum of Fine Arts' Sculpture Park, and for a spiritual experience, a visit to the Fo Guang Shan Buddha Memorial Centre, with the world's largest sitting Buddha, is highly recommended. Nha Trang, Vietnam - White sand beaches, turquoise waters, beachfront cafes. Nha Trang's days as an underappreciated treasure are over. Still very much intact since the 7th century are the venerated towers of the Cham Ponagar Temple complex. Sample shore excursions: Nha Trang City Tour; Nha Trang Countryside. Sanya, China - Sanya boasts splendid beaches stretching for miles and offers water sports from snorkeling to jet skiing. Asian Dragon Bay is one of the most famously scenic spots on Hainan, a tropical Chinese island that has been called ?China?s Hawai`i.? Other popular attractions include Nanwan Monkey Island, home to more than 1,800 endangered macaque monkeys, and the 354-feet-tall statue of the Buddhist goddess of mercy, Guanyin of the South Sea of Sanya, erected on its own island just off the coast. Singapore - It's an island city-state, a World War II battleground, a global economic superstar, and a crossroads of the world. Cruise to Singapore with Holland America Line and in the space of a few hours you can relax in a Chinese teahouse, purchase a colorful sari in Little India and visit the gold-domed Sultan Mosque. Owner's Suite (OS) - Queen-size bed, private balcony, separate living area with queen-size sofa bed, private bathroom with bathtub, separate shower and bidet, and concierge service. 559 Sq. Ft., balcony 90 Sq. Ft.
Grand Suite (GS) - Two twin beds that convert to a Royal King measuring 72.5 inches wide by 82 inches long, private balcony, sitting area (some with sofa bed), and concierge service. 349 Sq. Ft., balcony 100 Sq. Ft.
264 Sq. Ft., balcony 75 Sq. 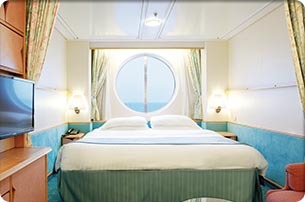 Ft.
Superior Ocean View Stateroom with Balcony (D1) - Two twin beds that convert to a Royal King, measuring 72.5 inches wide by 82 inches long, private balcony, sitting area and a private bathroom. Rates vary from deck to deck. 179 Sq. Ft., balcony 52 Sq. 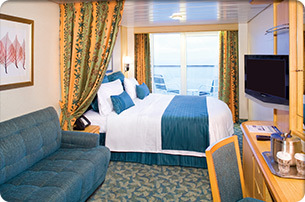 Ft.
Superior Ocean View Stateroom with Balcony (D1) Quad - Two twin beds that convert to a Royal King, measuring 72.5 inches wide by 82 inches long, private balcony, sitting area and a private bathroom. Rates vary from deck to deck. 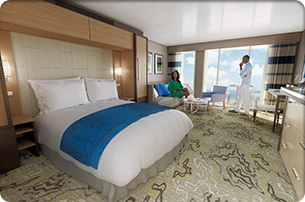 Deluxe Ocean View Stateroom with Balcony (E3) - Two twin beds that convert to a Royal King, measuring 72.5 inches wide by 82 inches long, private balcony, sitting area and a private bathroom. Rates vary from deck to deck. 164 Sq. Ft., balcony 51 Sq. 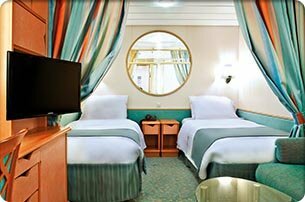 Ft.
Family Ocean View Stateroom (FO) - Two twin beds that convert to a Royal King, measuring 72.5 inches wide by 82 inches long, additional bunk beds in separate area, separate sitting area with sofa bed, and a private bathroom with shower. 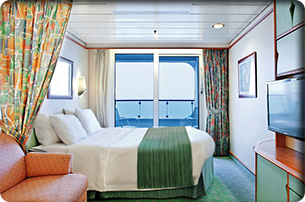 Stateroom can accommodate up to 6 guests. 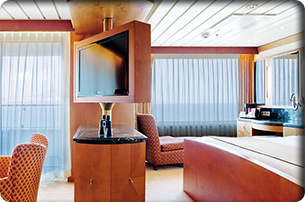 Ocean View Stateroom (H) - Two twin beds that convert to a Royal King, measuring 72.5 inches wide by 82 inches long, sitting area, vanity area, and a private bathroom. 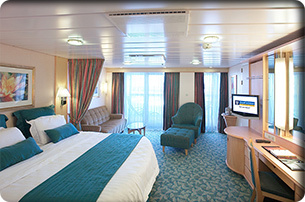 Interior Stateroom (N)- Two twin beds that convert to a Royal King, measuring 72.5 inches wide by 82 inches long, sitting area, vanity area, and a private bathroom.